Six colours and three table sizes available. Six colours to choose from. Napped cloth, intended for English pool tables. Pre-cut to suit your table size. Strachan 777 is a tournament-quality 100% wool pool table cloth. Strachan 777 is one of the most popular pool table cloths in the UK. The company has over 120 years of experience in producing woollen fabrics, and has condensed that experience into the 777 pool cloth. 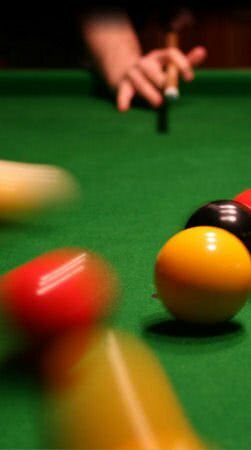 This high-quality woollen fabric provides skilled players on British tables with the ultimate playing surface. A crisp nap with a lustrous finish provides a silky-smooth ball roll, with consistent cloth colouring and excellent durability against cue damage and wear. The cloth is extremely long-lived, and will give unrivalled performance over its entire life. The result is a cloth that is used by the World Eightball Championship for their tournament tables, and can be found in thousands of pubs across the country. The Strachan 777 cloth features a SpillGuard treatment, which allows for the easy clean-up of spilled drinks and protects against swelling, odour or stains. This makes it ideally suited to busy social venues like pubs, bars or pool halls. SpillGuard is undetectable to touch and does not effect the play of the ball on the cloth at all. Owners of British pool tables should always consider the Strachan 777 cloth. High performance, durable napped cloth. With SpillGuard - liquid-resistant protection treatment. Available in three pre-cut pack sizes for slate bed and cushion re-covering: 6ft x 3ft, 7ft x 4ft and 8ft x 5ft. Available in different colours - Green, Blue, Red, Burgundy, Purple or Black. Fitting a pool table cloth is a complicated process. If you're unsure, let us do it for you. Call for a quote. Liberty Games recommends using professional cloth adhesive for maximum cloth performance.